D-10 ~ Journal of a dreamer. I have been watching MBC's Two Weeks (TW) recently. It is very unlike me to start watching a K-drama while it is still running in Korea 'cos I still have to rely on subs, which is not the case for HK dramas. However, the premise of TW did intrigue me (though it is said to be similar to Mandate of Heaven, which I didn't watch) and for starters, my favourites, Lee Joon-ki, Kim So-yeon and Park Ha-sun are all inside. By the end of episode 1, I knew I was already on board the TW train. Some dramas have really boring starts, which is why I give up watching them halfway, unless I happen to watch them again on Channel U, like Secret Garden. I gave that up after 2 episodes 'cos I found it boring, but when Channel U started showing it, I gave it another chance and found myself enjoying quite a bit. Maybe I wasn't in the mood to watch it the first time I started on it. DAMN. 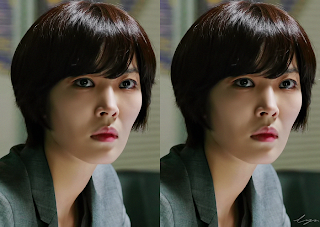 KIM SO-YEON IS SMOKING HOT AND SO BADASS IN HERE. She rocks the eyeliner so well. The more, the better. Unni!!! Jang Tae-san is your average bumbling gangster with no aim in his life. He creates trouble, but not till the extent of spilling blood because he has a phobia of it. One day, he is being framed for a murder which he did not commit. When he was nearly killed while in detention, Tae-san then decides to become break out of detention and so begins his fugitive life. The flashbacks that Tae-san had with Soo-jin and In-hye while being on the run seriously breaks my heart, and I really have to give it to the little girl who managed to steal my heart with such a heartfelt performance. Seriously, why are Korean kids so bloody good in acting?! I also have to hand it to Lee Joon-ki for portraying such a nuanced performance of Tae-san. Joon-ki is widely known as the Flower Boy of Korea due to his looks (he has really high cheekbones for a guy and I thought he looked quite girly during his early years, especially in My Girl), but wow, he totally blew me off here. In this drama, I don't find him girly at all. He looks so gritty and handsome here and I love how bastardy he was towards In-hye. He is really not a perfect person, but his imperfections are totally what makes him human, not superhuman. And Joon-ki's acting here touches me very deeply. All his emotions are so well-portrayed out I could really cry. ;_; Those eyes, those expressions. That heart. That anguish. That tears. All the praises on his acting in this drama are definitely well-deserved for him.